Baroque Painting in Rome, II: The High and Late Baroque, Rococo and Early Neoclassicism, 1620-1790 was written by Hermann Voss. 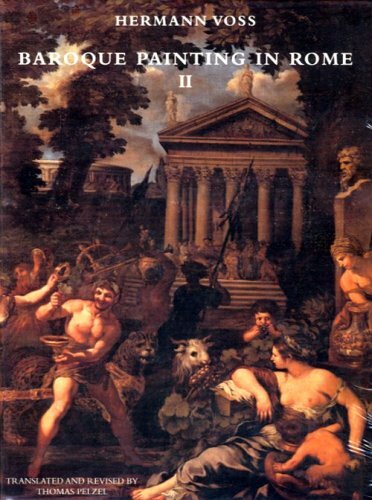 Baroque Painting in Rome, II: The High and Late Baroque, Rococo and Early Neoclassicism, 1620-1790 was published by Alan Wofsy Fine Arts. Subjects of Baroque Painting in Rome, II: The High and Late Baroque, Rococo and Early Neoclassicism, 1620-1790 include Art, and General. About Thomas Pelzel (Translator) : Thomas Pelzel is a published translator. A published credit of Thomas Pelzel is Baroque Painting in Rome, II: The High and Late Baroque, Rococo and Early Neoclassicism, 1620-1790.